It’s incredible the types of things one can purchase at an auction. Watching industrial auctions online has become a new pastime in this household, ostensibly in the search for the big-ticket tools to outfit the woodshop, but often enough we come across curiosities that cannot be passed up. That is how we ended up with two hospital-green 1960s office desks and a couple of like-colored wheeled stools along with the industrial bandsaw and lathe purchased at an online auction for a hospital closing way out in Pennsylvania (we could have snagged a piano and a greenhouse, too). Or how last spring when M and his brother Z (along with his wife E) drove out to a live auction at a high school being shut down, hoping to get a deal on a drillpress, ended up returning with a small forge for making jewelry and a potter’s wheel. I didn’t even know about the potter’s wheel until Z & E came down to the farm last week for a little vacation and brought with them some 50 lbs of clay, and suddenly this contraption was summoned out of the mystery world of things stored in the barn. Needless to say, once they brought it out, we spent a good two days fiddling with clay. 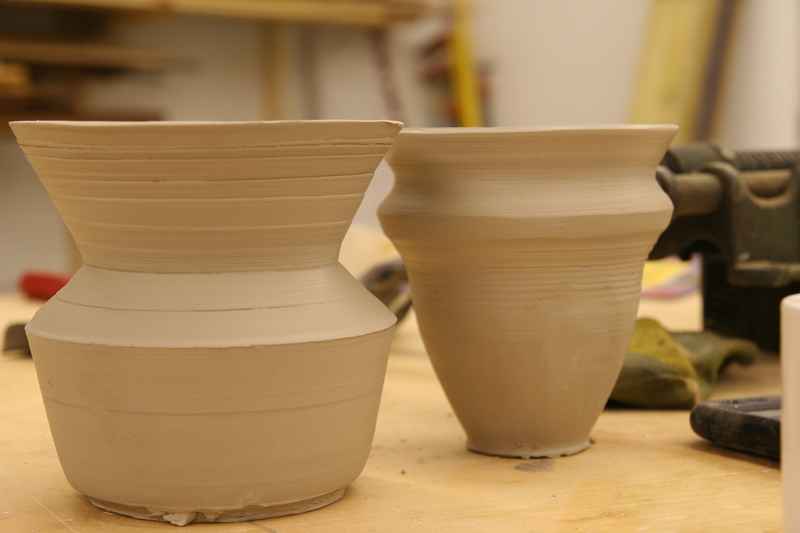 Z had done some ceramics in college, and gave us all a tutorial on how to wedge, then center and shape the clay, and ultimately draw up the walls of the cylinder into a pot. It’s quite fun, but a serious challenge to not gouge a hole in the wall or fiddle with it until the thing smushes past the point of no return. Between the four of us – truthfully, most of them were Z’s – we made a good 12-15 pots and had to figure out the best way to fire them. Out there in the mystery world of the barn, there is in fact a kiln built for just such a purpose. Unfortunately, we don’t have a safe place to set that up at present. So what’s the next best thing? A gigantic bonfire! As evidenced on youtube, lots of folks have done this and firing in a fire can create some cool patterns and colors on the surface of the clay so Z figured we ought to give it a try. M & Z built a big rectangular pit out of cinder block, and laid the pottery in gently, surrounding it with a cushion of sawdust. The objective is to shelter the pieces from the shock of the hot embers so that they can acclimate slowly to the hot fire and coals and then cook in there for a long time. Above the pots, Z built a little tray out of wire fence material and then started laying in the scrap lumber and more sawdust (we have lots of scrap lumber these days). After dark, we sat out there watching and warming ourselves by the fire. (It was really really really hot). 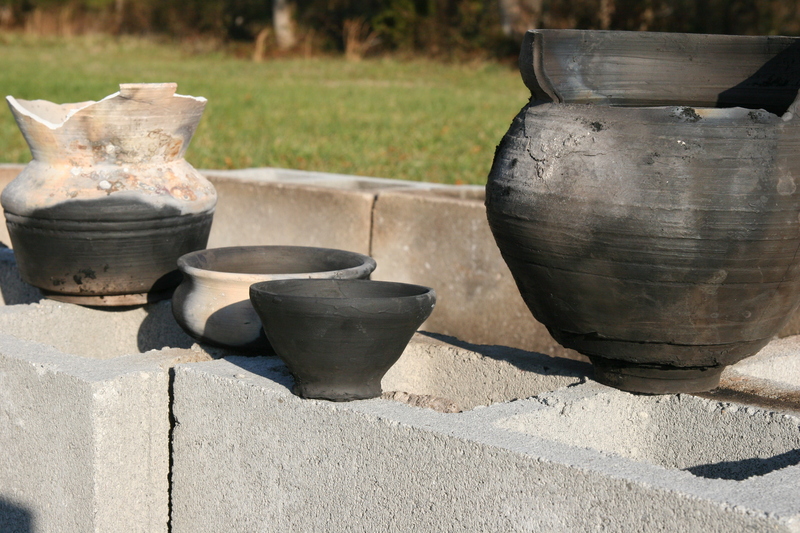 This project was an experiment from the start; we hoped that the pots would come out intact, but had good reason to expect that most of them might not. 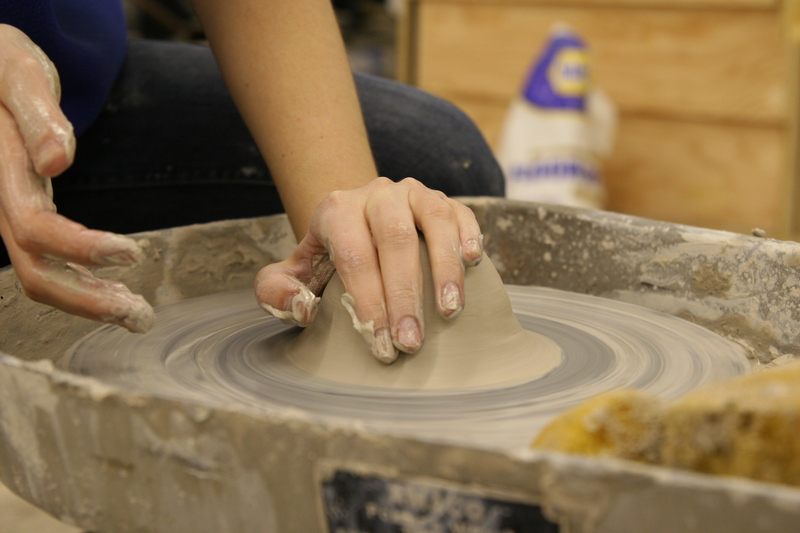 Any number of things can cause the pottery to crack or split apart, from air bubbles in the clay, to the pots not being dry enough before firing, or even the temperature rising too rapidly . The next morning the embers were still hot when Z & E started to dismantle the cinder block hoping to take a peek. It wasn’t until early afternoon that they began to retrieve the pots from the ashes. In the end, nearly all of them were cracked. Nevertheless, we learned what happens to pots in bonfires, and next time will make adjustments. I mean, we’ve got this potter’s wheel just hanging around now, it’s only right to keep putting it to use.